The first step is to saute the onions and herbs in oil. Once softened, I add the garlic sauteeing for just a minute. You don’t want that garlic to burn! Next up are the diced mushrooms and salt. 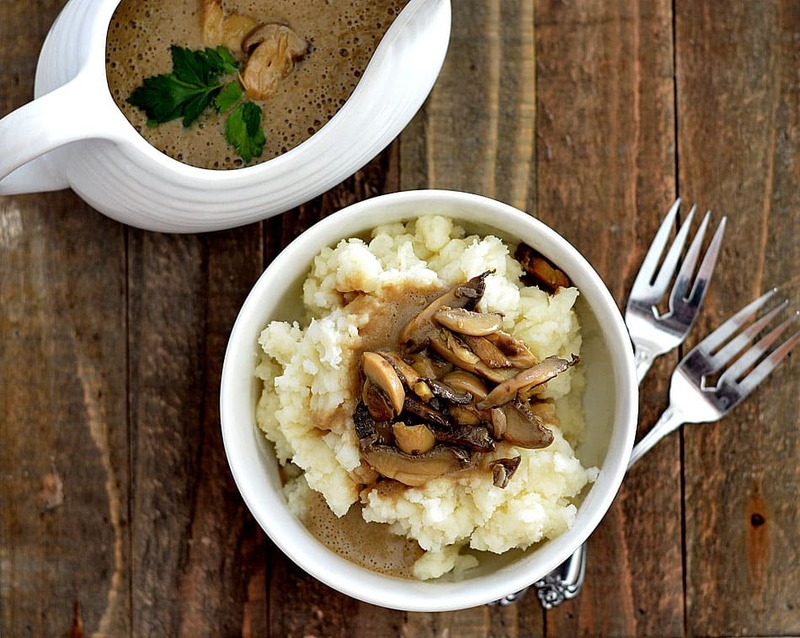 Allow this to cook down until the natural moisture in the mushrooms evporate. The mushrooms and onions should both be tender at this point in the process. While this is all happening, I make a cornstarch slurry. It’s just 3 tablespoons of cornstarch to 1 cup of the vegetable stock/broth in this recipe. Here’s a quick tip! The darker and richer in color your broth, the darker your end result. I always, always buy Imagine Vegetable Broth for this reason, but ran out and had a lighter version on hand. Kind of a bummer. 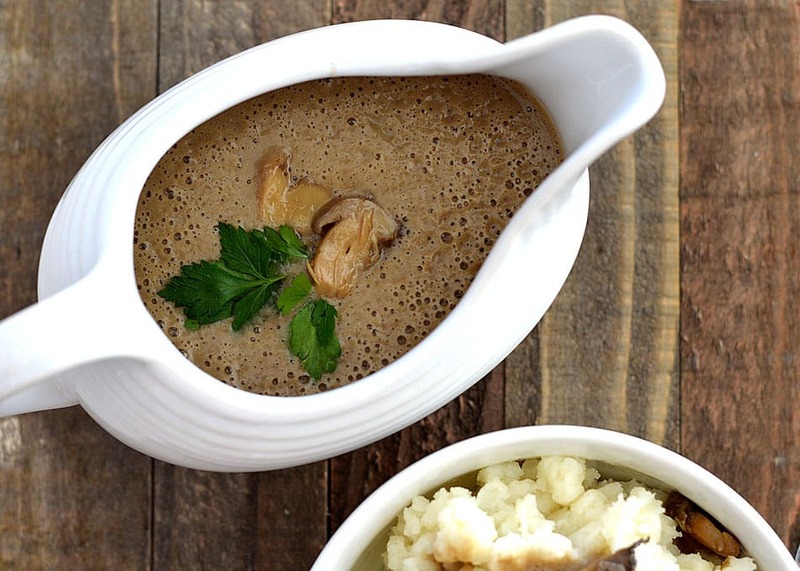 They also make a mushroom broth (which if you can find it, is definitely worth it). So in light of my situation, I opted to add soy sauce, both for color and flavor. It worked in a pinch. 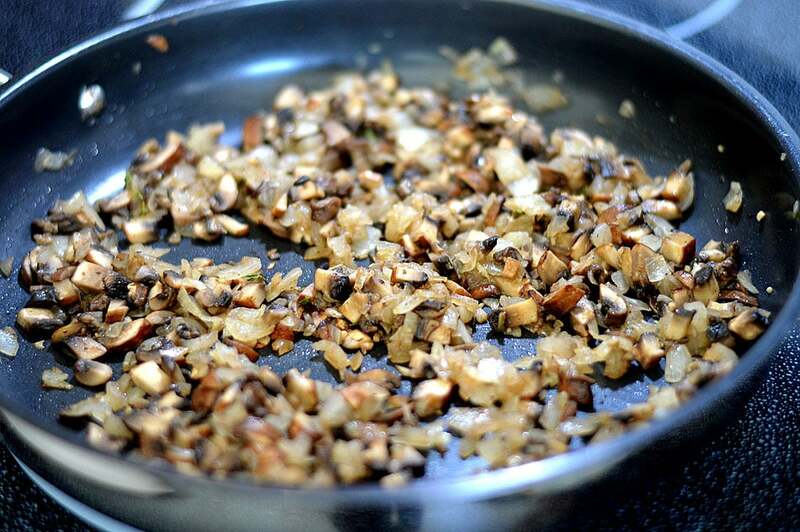 Once the mushrooms are all sauteed, I add the broth to the hot pan and bring to a boil. Once it reaches a full boil, I whisk in the cornstarch mixture and reduce the heat to medium. This is where the thickening happens. If it gets too thick, feel free to add more broth. It’s not an exact science. Continue to stir as it thickens. I’d say, about 10 minutes or so. Add soy sauce at this point and remove from the heat. I like to taste for seasoning after the soy sauce, as it does impart some saltiness. Give it a good sprinkling of pepper as well. 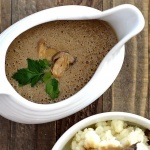 Did you make this recipe for Vegan Mushroom Gravy? If so, leave me a comment below and let me know what you thought! In a medium saucepan over medium/high heat, add oil, onion and dried herbs. Saute for about 5 minutes or until the onion softens and starts to become translucent. Add the garlic and cook for just a minute. Add the mushrooms and salt. Stir to combine the ingredients and cook for about 10 minutes, stirring occasionally while the mushrooms cook down and become browned. Meanwhile, combine cornstarch (or arrowroot or tapioca starch) with about 1 cup of the vegetable stock and whisk until smooth. Once the liquid from the mushrooms has cooked off, add the rest of the vegetable stock and let come to a boil. Whisk in the cornstarch mixture and reduce heat to medium low. 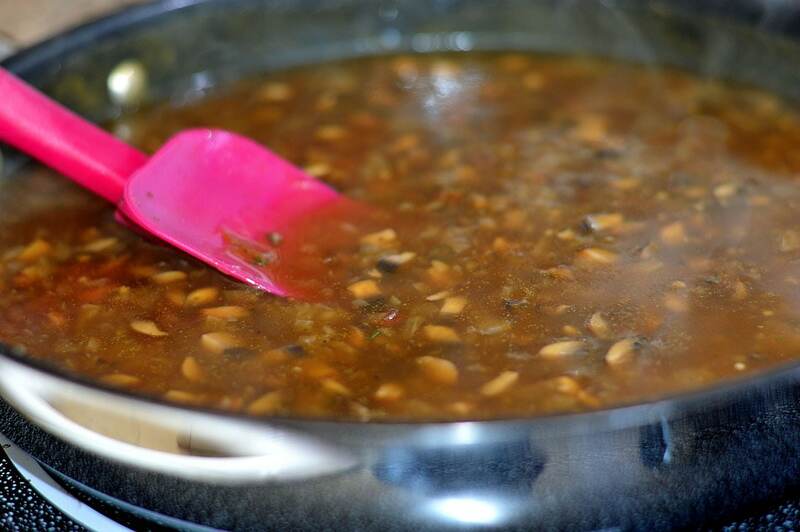 Stir constantly for about 10 minutes or until thickened. OPTIONAL: Add soy sauce to taste and season with pepper (and more salt) if necessary. At this point, it's ready to eat! You can puree it as I did, or enjoy it 'as is'. I kind of liked the little bits of mushroom and onion. I think I would skip the pureeing next time around. I added sliced, sauteed mushrooms for presentation.